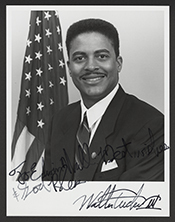 TUCKER, Walter R., III, a Representative from California; born in Compton, Los Angeles County, Calif., May 28, 1957; attended Princeton University, 1974-1976; B.A., University of Southern California, 1978; J.D., Georgetown University School of Law, 1981; admitted to the bar in 1984 and commenced the practice of law in Compton; deputy district attorney, Los Angeles County, 1984-1986; mayor of Compton, 1991-1992; elected as a Democrat to the One Hundred Third and One Hundred Fourth Congress and served from January 3, 1993, until his resignation on December 15, 1995. Walter R. Tucker III in Black Americans in Congress, 1870-2007. Prepared under the direction of the Committee on House Administration by the Office of History & Preservation, U. S. House of Representatives. Washington: Government Printing Office, 2008.